As a tried and true francophile, I have tons of books on France, Paris, French culture, studying French language and plain old books in French. 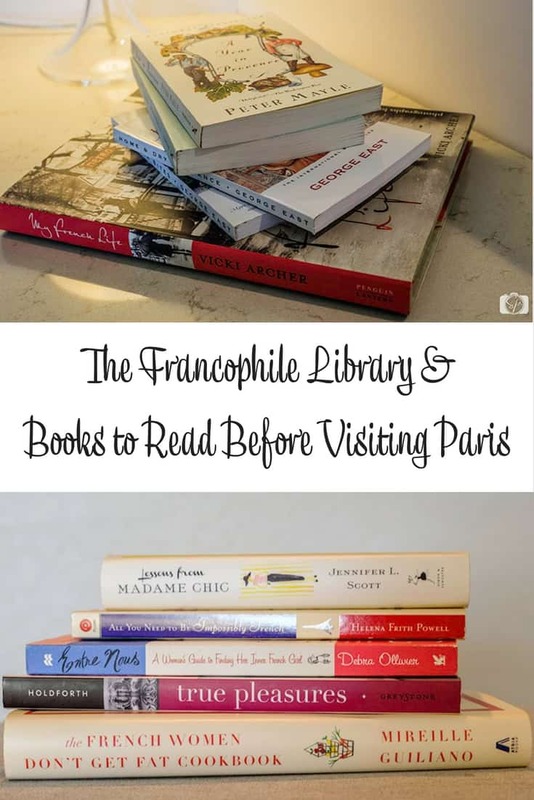 And while I’ve written a guest post about books to read before a visit to Paris on my friend Natalie’s blog, I haven’t consolidated my recommendations for building a francophile or books to read to prepare for a trip on Misadventures with Andi. Considering how much I love to read, that is an oversight! Also, as I’ve shared in my gift guide for the francophile in your life, books are excellent presents for any holiday all year round! They sure do put a smile on my face. Here are the books in my library (with a few exceptions which I will call out) maybe some of them will be an inspiration for you as gifts for the wannabe Frenchie in your life. Paris is many things to many people, that’s why books on Paris will always be popular and each one will always be different. The New Paris: The People, Places & Ideas Fueling a Movement Lindsey Tramuta: we all want to know about the new spots in Paris, but this book gives you so much more, including the most interesting to me, the history. Why LA? Pourquoi Paris? by Diane Ratican: an exploration, compare and contrast between two iconic cities with beautiful illustrations to boot. A Paris Year: My Day-to-Day Adventures in the Most Romantic City in the World by Janice MacLeod: one woman’s personal journey of living in Paris via her journal and watercolor illustrations. Bright Lights Paris: Shop, Dine & Live…Parisian by Angie Niles: I wasn’t sure if I should place here or with culture as it whimsically illustrates the different types of Parisians, but also offers great spots to eat, drink and shop. Quiet Paris by Siobhan Wall: ever want to find a nice quiet place in Paris to take it all in? The introvert in me screams, “yes,” which is why I love this book. The Paris Style Guide by Elodie Rambaud: another Parisian insider’s guide to the best things in Paris with a big focus on boutique shopping. Naughty Paris by Heather Stimmler-Hall: the saucy and sassy guide to more adult things to do in Paris. I am fascinated with French culture, there are thousands of years of history adding layer upon layer of cultural norms and tradition. People are equally intrigued by Parisian life for a good reason, it’s compelling! 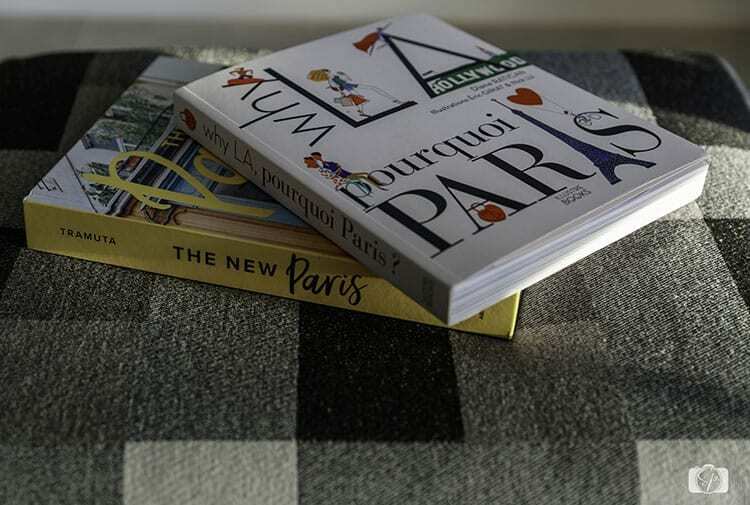 L’Appart: The Delights and Disasters of Making My Paris Home by David Lebovitz: having lived in France I can tell you, it isn’t easy to do anything, so it is fun to emphasize and lament with others, like David’s adventures and misadventures into turning a place he bought into a home. WTF?! : What the French by Olivier Magny: if you want a quick view into French culture with a little bit of snark, this is the book for you! Parisian Chic by Ines de la Fressange: a classic on looking chic and stylish from a Parisian fashion icon. How to be Parisian Wherever You Are: Love, Style, and Bad Habits by Anne Berest, Audrey Diwan, Caroline de Maigret, and Sophie Mas: a collaborate book from 4 women giving beauty, fashion and lifestyle tips, along with a few recipes. Paris Street Style by Isabelle Thomas: a fashion writer breaks down what she thinks the secrets to French style are. Lessons from Madame Chic by Jennifer Scott: when you live in France you are bound to pick up some of their style secrets. 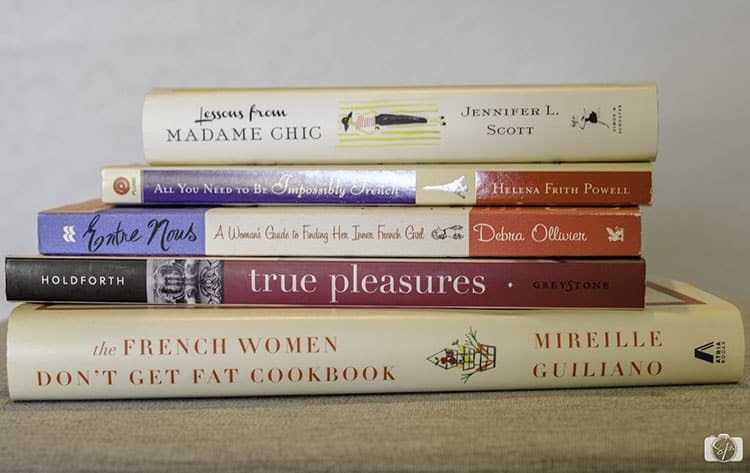 French Women Don’t Get Fat by Mireille Guiliano: not loved by everyone, but it was the first book (besides Eat, Pray, Love) that taught me about moderation and eating for pleasure. All You Need to Be Impossibly French: A Witty Investigation into the Lives, Lusts, and Little Secrets of French Women by Helena Frith Powell: an undercover look at French female culture. Entre Nous: A Woman’s Guide To Finding Her Inner French Girl by Debra Ollivier: insights into work, home, fashion, and relationships of French women. True Pleasures: A Memoir of Women in Paris by Lucinda Holdforth: the history buff in me loved the stories of Paris’s most famous women. What else is there in Paris? Oh, okay lots, but I really like the food and food history and the food tours…. Paris My Sweet by Amy Thomas: one of my favorite books on food in Paris, plus I loved the fact that she defended her love for La Coupole, a restaurant with bad food or not, is close to my heart because I love its style! Bonjour Kale: A Memoir of Paris, Love, and Recipes by Kristen Beddard: an exceptional story of re-introducing the French to a lost food. 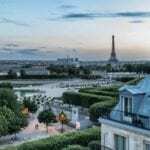 Delicious Days in Paris: Walking Tours to Explore the City’s Food and Culture by Jane Paech: I have yet to do all the tours in this book, but I eventually will! The Little Paris Kitchen by Rachel Khoo: fun, quirky take on classic French food. You can’t help loving this charming chef. I haven’t read her book My Little French Kitchen with stories and recipes outside of Paris, but it is on my wishlist! 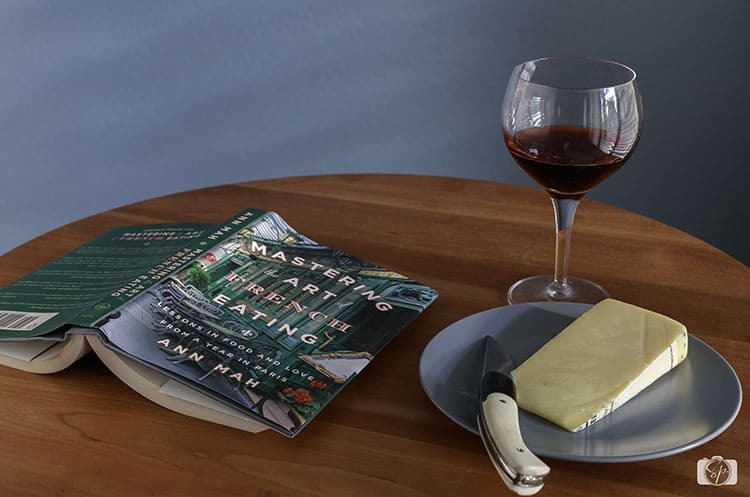 Mastering the Art of French Eating by Ann Mah: I never miss a newsletter from the author and love her book which covers being in Paris for a year alone which sparked a journey into discovering the history and taste of everything French! The Sweet Life in Paris by David Lebovitz: this was how I was introduced to this former Chez Panisse dessert chef and I love the mixture of anecdotes and recipes. Dated a French guy who I eventually married, have a French mother-in-law, had a French boss. The cultural difference is there and I make it a point to understand them rather than fight against them. Plus French culture is intriguing! 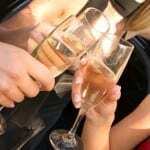 Sixty Million Frenchmen Can’t be Wrong: What Makes the French So French? by Jean-Benoit Nadeau and Julie Barlow: my absolute FAVORITE book on French culture, it was a lifesaver while dating my husband! It helped me understand the small intangible things that can really get on your nerves! I also have The Story of French about the French language, I love history and this is an excellent book about a language that was very important (before English kind of took over). Truth, I was also super excited to see this team has a third book which I just bought while preparing this post called The Bonjour Effect: The Secret Codes of French Conversation Revealed, because despite being with my husband 16 years the nuances of French conversations (and the way they fight!) sometimes still escapes me! Au Contraire! : Figuring Out the French by Gilles Asselin: focused mainly on the difference between French and American, it’s good for people working with (and living with) French people. The French Way: The Truth Behind the Behavior, Attitudes, and Customs by Ross Steele: a great overview of the French and their attitudes, tastes, and customs regarding business life, home life, and love life. Love a la Francaise by Polly Platt: specific to an Anglo woman dating a French man, this one will make you chuckle. I also have French or Foe? : Getting the Most Out of Visiting, Living and Working in France which I read right before I moved to France, and Savoir-Flair: 211 Tips for Enjoying France and the French which is decent for tourists. And God Created the French by Louis-Bernard Robitaille: How French (and Parisian) society really works! Cultural Misunderstandings: The French-American Experience by Raymonde Carroll: The fundamental subtleties of culture and the differences between French and Americans, written by a French anthropologist, so interesting! If you are a die-hard francophile who enjoys reading then you will love these series of personal memories of people who moved to France and either tried to set-up businesses or homes and were faced with lots of material to make a good book! Peter Mayle is a British author who writes about life in the South of France. From trying to work on the home he purchased in Luberon to food travels, his books are very entertaining. My favorites: A Year in Provence, Toujours Provence, and French Lessons: Adventures with Knife, Fork, and Corkscrew. George East is another Brit travel writer who moved to one of my favorite regions of France, Normandie. He is very sarcastic and funny and I love his books. Some of my favorites: Home & Dry in France, René & Me, French Letters and French Flea Bites. Stephen Clark is a Brit (again!) expat in Paris with a penchant for faux pas, these books make m giggle! My favorites: A Year in the Merde, In the Merde for Love, and 1000 Years of Annoying the French. Not a series of novels, but wonderful books about life in France. My French Life by Vicki Archer. 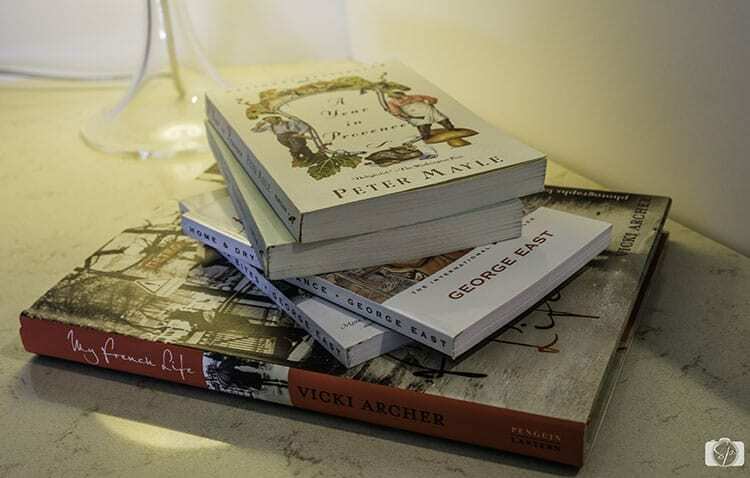 I love Vicki’s blog and have read it for years her books (love French Essence as well) make fantastic coffee table books, the photos of her French life are gorgeous. 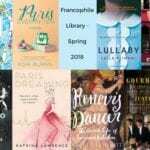 This is my current library right now, so I think it is safe to say that I am a bit of an expert when it comes to curating a francophile library! 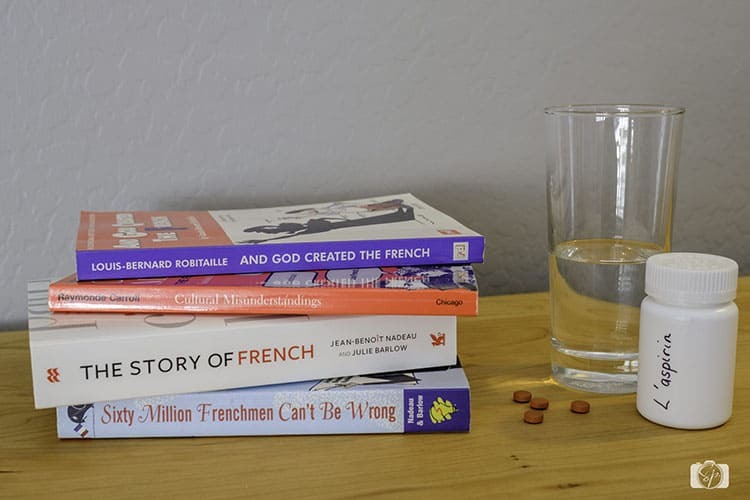 If you have a friend or family member who is French at heart, you can choose a few of these books as a nice little gift. 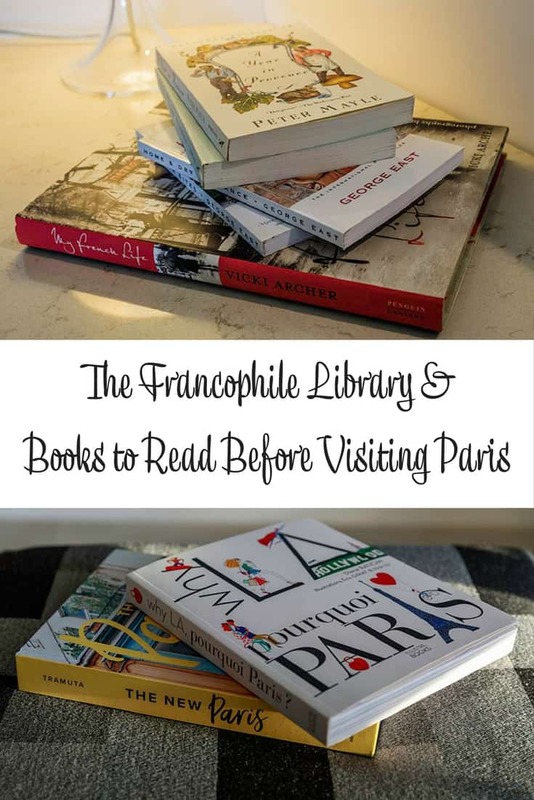 You can never go wrong with books about Paris or France and if you are planning a trip, reading a few of these ahead of your trip will make your visit that much more enjoyable! Now, how about you? Is there a book out there that I missed that you think I will enjoy? Do share! Have I inspired you to read anything of the books in my francophile library? Do tell! So many fun books. I may read a few just for fun! I went to France in high school but Iwould love to go back! So many books to consider. I have never been to Paris and pretty sure I won’t ever go there, but I can say that I love the French language. My mother’s maiden name means “good looking” and I have always been fascinated with my ties to French ancestry. I like reading travelling books especially their culture and language.This is a great list for travellers. I’ve never been to Paris but I learned french as a second language. It’s such a beautiful language! I am all about researching places with books before I travel! 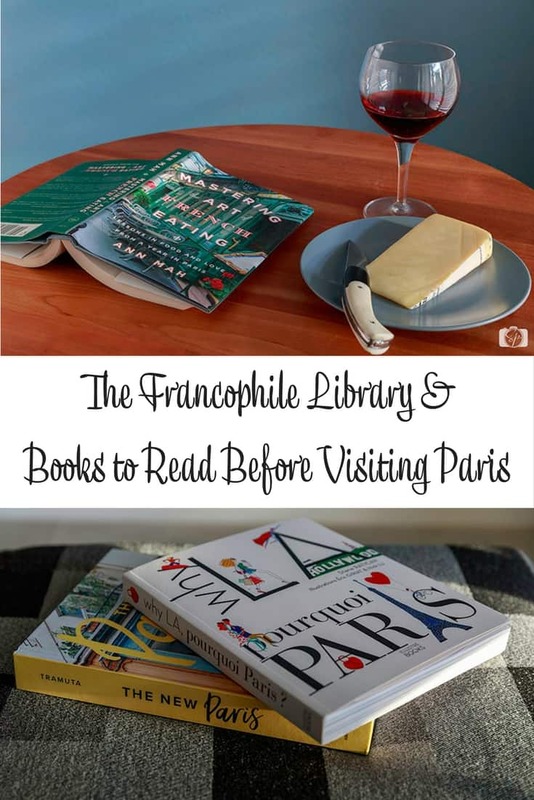 Your list of books sounds great to check out before visiting Paris! I would love to go to France someday. These books sound like a great way to build up my knowledge of all things France and also make it impossible to wait to go! OMG that cheese looks yummy. Cheese and wine are my weaknesses. I have always wanted to visit Paris, lucky you. I want to see if some of these books are in our library, we can access book from libraries all over the state! What a list! I can’t be the first person to say I thought you and Dorie Greenspan look so much alike! Great Reviews for Diane Ratican's Why LA? Pourquoi Paris? - Why L.A.? Pourquoi Paris? Thank you for including Bonjour Kale Andi!